Man, I’m feeling bummed right now. I would guess that my mom is too based on her tears when I dropped her off at the airport this morning. She starts to cry, then I start to cry…it ain’t pretty! I think I even saw a nearby taxi driver shed a tear. The good news is, we’ll always have this incredible oil-free Zucchini loaf to remember the good times and great food on this trip! I even sent her off with a big slice to take on the plane with her. It comforts me knowing that she has my yummy homemade food to eat instead of cardboard plane food. I’m a strong believer in wholegrain carbs when you’re feeling blue! Plus, carbs are addicting which means that she’ll have to come back to visit real soon…right? 1. Preheat oven to 350F (see note below). Mix the flax egg and set aside. Oil a regular-sized loaf pan and then line it with parchment paper so you can easily pull out the loaf when cooled. 3. In another large bowl, combine the wet ingredients (flax egg, shredded zucchini, lemon zest & juice, maple syrup, milk). 5. Spoon the batter into prepared loaf pan and spread out evenly. Prepare the cinnamon streusel and then sprinkle on top. Bake for about 45-60 minutes at 350F or until toothpick comes out clean and the loaf gently springs back when pressed. 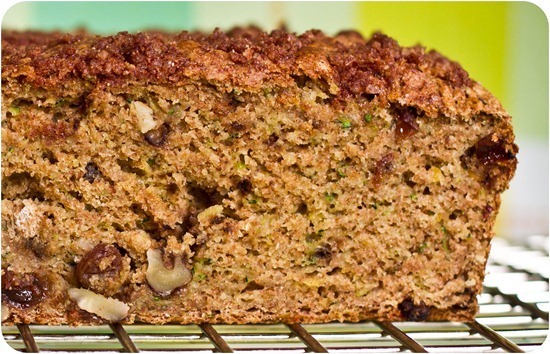 The shredded zucchini does a wonderful job giving this loaf moisture..and you don’t taste the zucchini at all. You can see beautiful flecks of green though! It’s a very dense loaf, but not in a bad way! Whole grain spelt flour tends to make dense breads, but I just love the nutty flavour of spelt so I don’t mind. The walnuts, streusel, and raisins add just the right amount of sweetness and crunch. 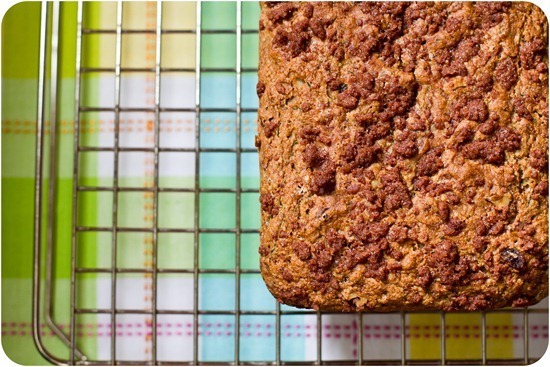 We’ve been enjoying this not-too-sweet loaf for breakfast or as an afternoon snack. If you like your baked goods sweet you might want to add another 1/4 cup of sugar, but we thought it was just perfect for a healthy snack. It’s wonderful spread with Earth Balance, nut butter and jam…or just enjoyed plain! Aw I’m sure your mom misses you even more right now! Did you always feel this way about your mom, or did you go through those teenage years at some point (which is what I’m going through right now!)? Love this recipe! I bookmarke it, and I can’t wait to make it some time soon. The ingredients are absolutely awesome! Gorgeous photos and such an inventive & delicious (not to mention healthified!) recipe as always Angela! Can’t wait to try it out. I made Zucchini “Bread” Oatmeal yesterday! Reading your recipe for “real” bread, I realize I totally should have added nutmeg too. It was awesome though! I hate having to say goodbye to my family, even though I know I’ll speak to them soon. I like the idea of baking something that’s oil-free, and then topping it with a bit of nut butter for some healthy fats. I hear streusel and I am sold! Looks amazing! Oil free goods are really good and so tasty. Most times I am shocked that the taste is so amazing sans oil. I look forward to making this one day soon. I can’t imagine not living near my parents… they are so important to me and I’d find it so difficult! Will you be visiting them this summer? Is it possible to add a squished banana and reduce some of the sugar? Im not sure because the sugar is dry and a banana would be considered a ‘wet’ ingredient. 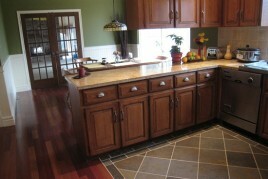 It is usually suggested to maintain the same ratio of wet to dry ingredients. The loaf is already very moist and dense and I would be afraid that a banana might make it too ‘heavy’. Perhaps you could reduce some of the zucchini to maybe 3/4 cup? I have been on a bread kick recently. This is going to be next on the list! Awee I bet your Mom is missing you a whole bunch too!! I know the feeling too my Mom and I are more like sisters since I’ve left home and I always anticipate our visits while I’m living in my home during University. How we get by? Tons and tons of phone calls, it makes a world of difference :) And like everything, a little bit of chocolate helps too! Making this with my mom when I see her in two months (yay!! it’s been since Christmas time last year!)! I hope you and your mom chat via Skype – that helps my mom & I at least “see” each other. Your photos are so bright and beautiful on this post. 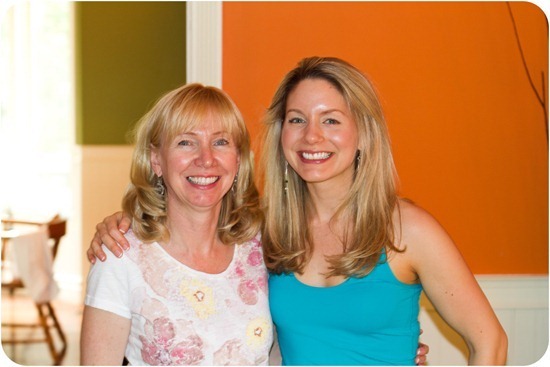 Beautiful mother & daughter alike! Cheers & have a wonderful day! This looks so good! I love your recipes. I’m waiting for the avocado on my counter to ripen so I can make your avocado pasta again. Looks good, I’m bookmarking this for when our zucchinis start grow in like crazy!! 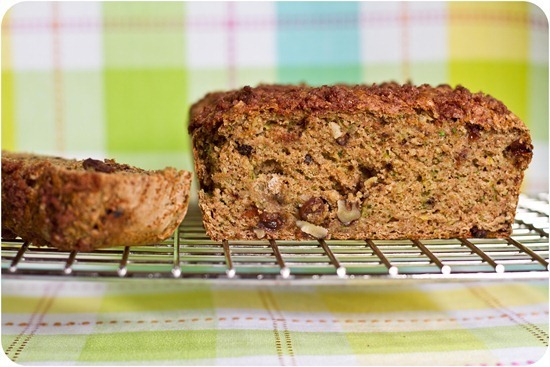 I’ve been looking for a great zucchini bread recipe.. and I think I might have just found it! Thanks so much Angela!!! This looks fantastic with the melting butter (or Earth balance? ;) ) on it! Great recipe! I like to sub in canned pumpkin or sweet potato puree for the oil. Makes baked goods so rich and moist. Nice trick with the non dairy milk! Awwh so sweet!! I’m glad you guys had a great visit! Might have to give this a go!! Yum :D That looks awesome. Love zucchini bread! Growing up our garden had more zucchinis than we could handle. A family recipe that’s been handed down over the years is chocolate zucchini cake. We’d whip up cakes to hand out as gifts – we had that much excess zucchini. Some people get weirded out but it is the moistest? cake I’ve ever had. I’ve found it posted online but it’s just not the same as my great-grandma’s! I’m going to have to try out the loaf! Aww, hang in there with your mom leaving… I am exactly the same way with mine. Your bread looks delish:) Can’t wait til I have a surplus of zucchini to use! Glad you got to spend time with your mom. I always get very emotional whenever I leave my family or they leave me. I only get to see my family a few times a year. My hubby and live about 5 hours from both of our parents. Awww… I know what you mean! I live a 5-hr drive from my family, and they all came to visit this weekend (including my sister and 2-year-old niece). Seeing them leave was HARD! It is! My sister, BIL, and two nephews are coming for a week in july and I know i’ll be super sad when they leave! Aw, I hate good-byes!! Hopefully you’ll have another visit in the very near future. Your loaf looks great – I was expecting to see applesauce or something like that in lieu of the oil! I can’t wait to give it a try; especially once zucchinis come into season. I think the zucchini might replace the applesauce in this oil free bread because it has so much moisture! Aww im sure your mom loves having you send her off with snacks when she leaves. I am the same way I hate leaving my parents we always have so much fun together! My ex-boyfriend’s mom used to make me vegan chocolate zucchini bread, it was so good! Glad you and your mom got to spend some quality time together! The loaf looks incredible! I am allergic to walnuts so I will have to sub out with a different nut if I make this! I’m sure it will still work out fine though! :) I love baking with zucchini! Mmmm.. This looks so moist. I love dense bread. I’d love to make French toast using this bread! P.S. 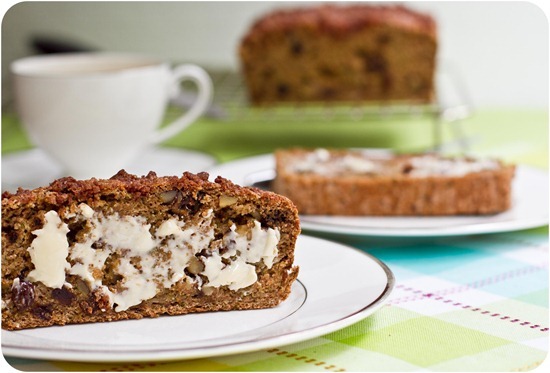 I’m loving the looks of this zucchini bread!!! Wow that looks SO good! I can’t believe there is no oil in it! That looks amazing!!! This looks looks great! I love zucchini and crumble topping. Glad you had fun with your mom! I miss mine a lot, too! I remember visiting my Grandmother as a little girl and watching my Mom cry as we left her house after our vacation was over. At the time I didn’t understand it because I had my Mom with me all the time, but now I can definitely relate. Leaving your Mom is hard! Oil free sounds perfect to me! Especially if streusel is involved! I’m glad you had such a nice time with your Mom! I’m lucky to live within 5 minutes of my parents, but when I lived a few hours away from them I remember getting so sad after they came for a visit — it is so nice to spend time with them! I’ve never been a big fan of cooked zucchini (e.g. in a stirfry). Then last year my neighbour offered me a load of zucchini. I didn’t want to offend her so I took it. This led to some exploration and an amazing string of recipes: raw zucchini soup, chocolate zucchini bread, raw zucchini pastas, zucchini hummus etc. I love anything with streusel, so this recipe will get added to the mix! This looks SO moist for being oil free! Can’t wait to try it! 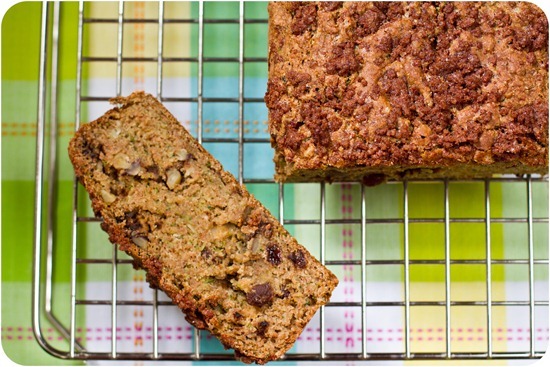 If anything could cheer you up it would definitely be a big fat slice of that yummy zucchini bread! :) Enjoy! That bread is almost as gorgeous as you! This looks so good! Like the perfect after work snack for me. I must make this soon. My parents lives 800 miles away and its really hard when they leave after a great visit. Not fun. But they are coming to see me this weekend so I am excited, maybe I should make this for them! I am bookmarking this NOW! My garden is about to overflow with zucchini!! Now that I’m all grown up and moved out, I find myself calling my mom and dad a lot during the week just to chat! I just had an interview for a full-time teaching position, and if I get the job I’m going buy myself a congratulatory camera like yours so that I can really start focusing on the photography portion of my blog!! I love your pictures. I just happen to have a couple large zucchinis sitting in my fridge, as well as some negleted walnuts and raisins in my pantry. I think this recipe should put them to good use! I can’t wait to sink my teeth into this and top it with the strawberry freezer jam I just made!!!! My mom just moved this past week, and it’ll be rough having to see each other via plane. Ugh… not looking forward to that! Hey Angela, I was wondering… I have all the ingredients to make this loaf (which I plan on making today!) except I only have chia seeds. In general, would a chia egg work in place of a flax egg? Which do you prefer? Oh my gosh, this is PERFECT timing! I really, really wanted to try out a new quick bread recipe this weekend. Ever since I made my first (good) gluten-free carrot cake loaf last month, I’ve been addicted to eating quick breads before my long runs on the weekend. This looks so good. I will try to make it gluten free this weekend and report back. Dun dun duhhh… I’ve learned that making gluten free quick breads from a gluten recipe rarely works on the first try. So it may take me a bit to get it right! Also, I love the soft corners (I’m sure there is a technical term) you’ve been making on your photographs lately. It adds such a nice touch! My inability to bake properly will totally not keep me from trying to make this! I love baking with zuchinni!!! Thanks for the recipe! I am whispering to my zucchini plants what their fate will be. I’m sure they won’t mind. Mua ha ha. An oil free loaf? Count me in on trying this out! Awww, Angela. I’m so sorry you had to say goodbye to your mother today. I hope you’re able to say hello to her again very soon. I feel the same way when I leave my family! Great plan for giving her some addicting carbs so she will come back to visit, although I am thinking she will be back for lots of other reasons, like maybe just to hang out with you amazing daughter! :) I always do best when I keep myself busy after my company leaves…takes your mind off things. The loaf looks outstanding! and OIL-FREE! Oh I forgot to mention…I made a version of half the calories, double the fun almond butter (see today’s post) and I am thinking it would taste amazing on the loaf…I might just have to go do some baking! Oh girlie! I always feel the same way when I leave my mom. We’re separated by 6 hours in the car, and it’s way too far. ON a positive note, the loaf looks goooooood. Can’t believe it’s oil-free! The loaf looks wonderful. love the shot with the earth balance on it. Everything is better with butter :) Or buttery spreads. And you and your mom getting all teary eyed upon leaving each other…Awww, Ange, major hugs! I know how close you and your mom are and I can only imagine you are feeling very….bummed right now. I hope you two can see each other again, soon! hmm im not sure! Sometimes I find WWPF can be crumbly in a loaf. Let me know if you try it out! Thank you…I let you know if I try it. Or I may just get the spelt flour! I just made zucchini bread the other day (which was amazing), but I really wish I’d seen this recipe beforehand! I love that it’s oil free and the cinnamon streusel sounds fabulousss! I love zucchini bread. I bet this would be sooo good as french toast. aww you and your mom are so cute! :) so sad to say goodbye isn’t it. I live about 4000 miles away from my family right now, I definitely get homesick quite a bit. This looks delicious! Can’t wait to try it. Your mom is too cute! Great minds must think alike – I baked choc ZUCCHINI friands on the weekend! The bread looks perfect and it’s so pretty. 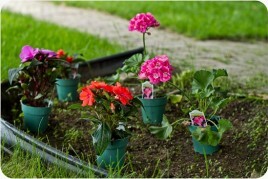 The colors in your post today are so cheery + fabulous. I’m so sorry your mom had to leave so soon. I know that feeling and it’s awful. :( Despite being sad…I hope you have a great rest of the week! This looks amazing! do you think would it work with grated apples or carrots? I love the green speckles in the loaf though!! This recipe looks scrumptious. I will be making it soon! Hope your mum gets to come back soon as well! This recipe looks absolutely A-M-A-Z-I-N-G!! This is exactly the kind of recipe I look for when doing my baking. Whole, simple ingredients that is healthy, vegan and delicious! Thanks for this, I look forward to more of your oil-free baking experiments! I love the idea of flax egg! I’m definitely going to give that a try in some recipes! I have to stay completely away from sugar, do you think I could substitute something else for that, such as honey? Please e-mail me as I’d really like to try this, thanks! Aww, You look JUST like your mom! y’all are b-e-a-utiful!! All of your recipes rock my world, & i’m sure this zucc loaf will live up to the standard! I am looking forward to coming back to this post/recipe when my garden is full of zucchini next month! YUM! This bread looks FANTASTIC! Just my kind of carbs, really! I have to give it a try, and soon! This is sooo going on my must try list! Being oil free, is the bread still crumbly, or is it more of a chewy texture? AMAZING!!!! I made this loaf to take with me to Europe today… but I am not sure it is going to make it there : ) another hit, thanks Angela! Mmmm! I made this last night and had two slices for breakfast. It was gooey and dense and wonderful. Don’t you just love susan’s recipes over at FF Vegan? I love zucchini bread and finally had the time to try this recipe today. I didn’t even use the topping and it is so good! Thanks for sharing. I will be making it numerous times over the summer, especially when I visit my friend who has recently become a vegan. Yum! I made this last night with a few changes (ok a lot of changes) and it was DELICIOUS. I think I’ll make another loaf and freeze it since I have tons of fresh zucchini from my garden. Could the flax egg be replaced with chia seeds? If so, how much? And is it possoble to add more zucchini? If so, what wet ingredient would I need to reduce? Thanks so much! Love your blog. You inspire me! I love this recipe! I want to try making it again but with agave instead of sugar. How much almond milk do you think I’d need to reduce and do you have a general idea of how much agave to put in? Has anyone else had this issue? I really want to make it again but don’t want to waste the ingredients if it doesn’t work…would really appreciate any feedback! Hi, I just made it too and had the same problem. I was sad as it cost a lot for the ingredients and I was going to use it for a snack at work. I cooked mine for at least an hour and a half and it was still gooey and inedible. It seems as if many people have written with the same problem. Why has the author of this recipe not responded to any of the concerns? I surely won’t use any of the other recipes on this site. There are many good vegan cookbooks that are true and tested. I will stick to those. 2 stents and am on a strict diet. enjoy your friendly and funny blogs! Just made this and OMG – best ever! I didn’t have spelt flour and used 1 cup whole wheat and 1 cup white whole wheat flour. It was less dense, but incredibly delicious. I will be making this frequently. Thank you! You are such an inspiration to me! I am sixteen years old and have been struggling with an eating disorder for two and a half years. I have been treated four times, and I am finally trying to eat healthily and get my life back. This year, I have come to learn about the cruelty dealt to animals in the food/ clothing/ cosmetics industries. I am dying to become vegan and teach others about the benefits to humans and animals when abstaining from meat. Unfortunately, I am forced to eat meat twice a week, which I eat in the form of fish. It is a painful process, because I feel disgusting and horrible for the animals. Putting meat into my body just feels wrong! I have one in the fight to refuse dairy, though!!! I have also had lots of trouble with exercise, which means that this is the first year I can exercise healthily! Being as healthy as you is my goal!! Thank you for your recipes!! Thank you Amelia!! I appreciate your kind words. Thank you so much for this & all of your amazing recipes. Seriously, every recipe from this blog is fantastic, and this bread is definitely no exception. So moist, such fantastic flavors, and best of all, healthy!!! Wow – this loaf is amazing! I brought it along with me to a girls weekend where no one else is Vegan. Forget about not believing it was Vegan – they couldn’t get past the fact that it is oil-free. Absolutely delicious!! Looks yummy! I don’t have spelt flour on hand but I have some Bobs Red Mill gluten free baking flour and I also have some oat flour. Can I substitute either of those for the spelt flour..or a combo of those two? Hey Bethany, I haven’t tried it any other way, so I cant say for sure. Spelt flour can be tricky to sub sometimes, but let me know if you try it out! I actually used the oat flour and it’s still in the oven now – I put it in at 375 for 40 mins and checked it and it needed more time, then I checked after another 10 and thought it was done, but when I cut into it, it was really raw/doughy on the bottom half so I put it in for another 20 mins, still raw! So right now it’s in the oven for another 20 mins…hoping that it will cook through because it smells so yummy and the top tastes great! haha Any suggestions? Update – The Oat Flour was a Fail…..hahaha. Thankfully I still have a ton of zucchini to use up from my garden! Going to grab some spelt flour and try this out -as written – asap! 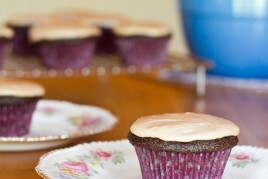 :-) Thanks again for posting this recipe! Hi! I made this bread the other day and it smelled amazing in the oven…I went with your suggestion of baking at 375 for a bit longer and had a bit of trouble getting the bread really done! My oven does tend to run a little warmer than it says, so maybe it really needed the 400? Took forever, ended up not being 100 % baked through in the centre, but still delicious! I would definitely make this again, but I think I’d make it into muffins to make sure it cooks through! What size loaf pan did you use? OK So I tried this again with Spelt flour this time! I set my oven to 375 checked it after an hour and it still wasn’t cooked through, so I checked it every 10 mins after that and took it out at 1 hour 30 mins. Still not completely cooked through and this time I followed the recipe exactly. It’s cooling right now, I didn’t want to leave it in any longer because the outside was getting tough. Any suggestions? Not sure what I did wrong this time. Hi cat, I’m going to work on this recipe – thanks for letting me know! I’m sorry you had problems with it. I was looking for a zucchini bread recipe . I found you’res and made it today. I am starting to eat clean foods. Your Ideas are great. I loved the zucchini bread. I could not let it cool down enough,before I had to try it. Oh how wonderful . I even ate the parchment paper by accident . I had two more pieces of bread and I did not top off the bread with the icing. Lol I am having the happiest day looking at all of your food. I would love to try this, but I can’t take that much fructose…any other things, I could use instead of the raisins? more nuts maybe? Can I use cow’s milk? It’s all I have in the house at the moment. Another great recipe Angela. I only had cane sugar so my crumble wasn’t crumbly so I added some oats to it. It was great. I love your recipes, they’re always so reliable!! I recently developed a recipe that was very much inspired by this one (I linked you on my blog), I hope you check it out! Love this recipe! I have made it many times. Today my teenage daughter pulled out this recipe and with a very big hint suggested I make it today ;) I did of course, along with a double batch of the Eat your greens Detox Soup from your cookbook! I have made my own modifications to your recipe. I have a convection oven. I place the loaf at 375F for one hour and this bakes it just right. I also double your spices 1 teaspoon of cinnamon and 1/2 teaspoon of nutmeg. Our family really enjoys this loaf along with many of your recipes which never fails to disappoint! Thank you! Wow! Once again I am blown away by one of your recipes! These days literally everything I make comes from your website or your book. I trust it all because it’s always spot on and delicious! For this recipe I omitted the streusel and I used chopped dates instead of raisins and it was so good! 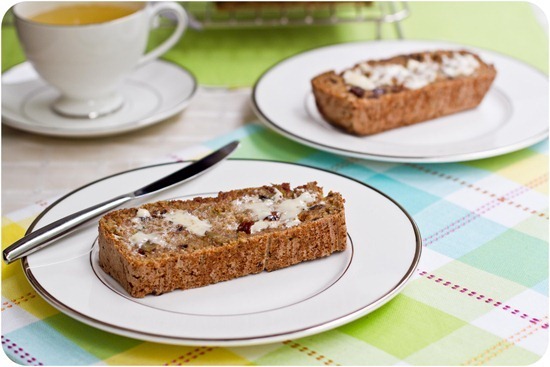 This is a perfectly moist, not to sweet loaf and a great way to incorporate zucchini into your breakfast! This looks amazing! Any suggestions on substitutions on the flax egg, I don’t have ground flax, but have flax flour, chia seeds, and hemp seeds? Hello. I’m new to your blog, but I already have bookmarked a dozen recipes! I don’t have a load tin, can I use an 8″ cake tin instead. Would I have to adjust the barking time? Thanks. I look forward to trying out a lot of your recipes. Happy 4th! I would like to know if I can use gluten-free flour for this recipe and for the chocolate zucchini muffin recipe? Thanks! Made it tonight, gluten free (only flour I had available, and had a huge zucchini waiting for me when I returned from vacation). Used half brown rice flour and half buckwheat. Turned out great.. A little bit crumbly, but not terrible. Just stumbled on your site today when looking for a gluten and dairy free eggplant dish. 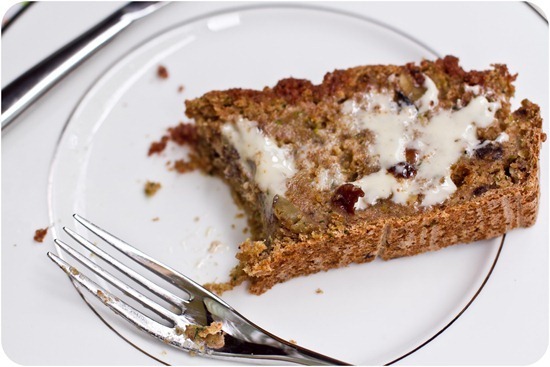 I made your eggplant /zucchini casserole for dinner… very good and now am baking your cinammon walnut bread with gluten free flour – smelling good! Looking forward to trying more of you yummy looking food. Love the pix of you and your Mom, mine haas been deceased now for 9 years,but looking forward to when 1 of my 5 adult chidren have kiddos of their own. 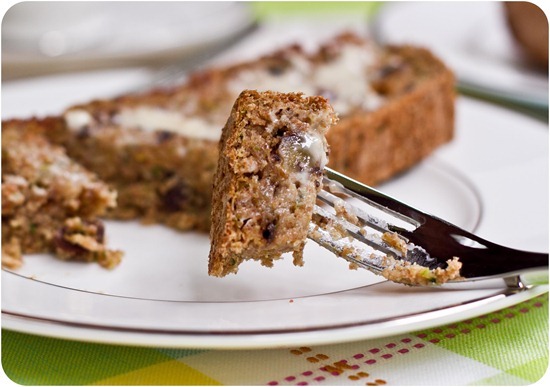 This zucchini bread is delicious! My husband said he could eat it all day long! :) I’m making your 10-Spice Vegetable Soup right now. Served it to our kids when they were here a couple of months ago and they loved it—— our son asked for the recipe! It’s a really good soup recipe and does freeze well! Thank you, Angela, for 2 more great recipes! Made the GF version of this and came out so good!! Used 1 cup AP gluten free flour + 1 cup buckwheat flour. Also subbed honey and egg instead because I’m not vegan. Cooked it for 45 min and it came out perfect! Heard people saying things about not cooking all the way or too gooey so I omitted 1/4cup milk and it was so tasty ? This is delicious! I followed the recipe as written but reduced the almond milk to 1 cup based on other reviews. Non plant based followers requested a 2nd slice! Sadly this is a fail…. It’s the third recipe I’ve tried this week that just. Won’t. Cook! Crisp on the outside, pudding on the inside :( Devo because it smells great! What a nice blog post! I miss my mum too and start to wait for her next visit the moment she has left even now when i have my own baby! And also love to give her some baked goods to munch on while traveling. Baked the bread today, it was delicious! I think it will be only thing i am going to eat today :D i did added a bit more flour as batter seemed to thin and it turned moist but not mushy. I made it exactly as written and baked it for 60 min, but it turned out a bit soggy in the middle. Hence, I recommend putting the amount of flour in weight instead of volume (cups). Also, I recommend changing the title to Lemon-Zucchini Loaf/Bread as the lemon flavour sings out well. Hey Laurie, Thank you so much for your feedback! I appreciate it greatly. It’s been a while since I’ve made this loaf so I will have to test it again soon. So glad you and your little one are still enjoying it. Any updates on this recipe? Also, regarding my previous comment: after finely grating the zucchini I squeezed it in a tea towel in order to get out unneeded moisture. Lots of moisture came out, but it still turned out soggy in the middle. That said, my 2-year old tot and I are enjoying it. I finally made this. It’s too good! My husband said “This tastes like it’s really bad for me.” I’ve eaten a third of the loaf this morning and I never do that. Ever. I did a few modifications: Ener-g egg replacer instead of a flax egg as well as Ener-g instead of regular baking soda/powder. Whole wheat flour instead of spelt. Left out the raisins and walnuts in the bread but incorporated 30g chopped walnuts in the topping instead. I think the lemon zest/juice really makes it. Yum. 5/5 stars.